‘a house in omiya’ by japanese atelier dai nagasaka / méga is a two-family home at a corner of a street in kyoto, japan. experimenting with the form and elements of a hirari – a traditional japanese structure where the entrance runs parallel to the roof’s ridge – the design features an exposed wooden ceiling that peaks to the inner corner of the building. occupying a corner lot of a three-way junction in the street, the design exhibits three faces to the road. the faceted elevation creates a private nook that accommodates a sheltered entrance. a continuous strip of glazing wraps around the surface, balancing out the solid expression of the exterior with a slice of transparency. 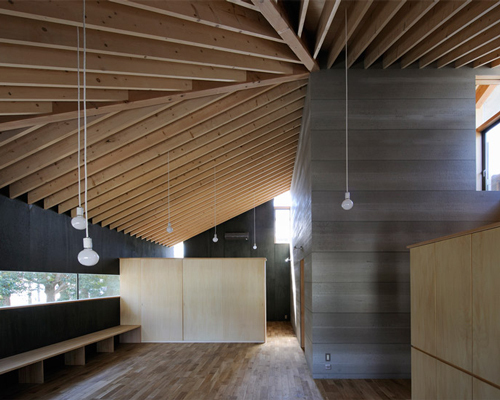 with a rhythmic display of wooden beams, the interior weighs focus on the ceiling which slopes up to the southwest corner of the house. a rectangular volume has been inserted into the layout, serving as the circulation and utility core of the residence, as well as providing structural support for the roof form. 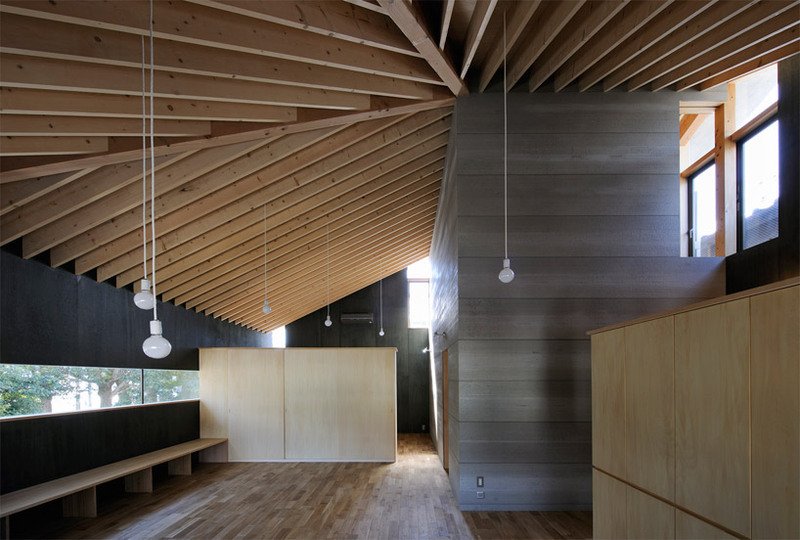 a small room is also hosted at the top of the form, providing a private area from the communal space below. the linear window injects views of the park into the atmosphere of the living space. – the strip window doesn`t do any good to the exterior image of the house (in my opinion). Love the design, might not be entirely practical, but when you focus on form you rarely retain all the functionality. I dont understand why take such a classic urban tipology to shape the exterior form when there is no such thing in the neighborhood really. The doos is too squematic.